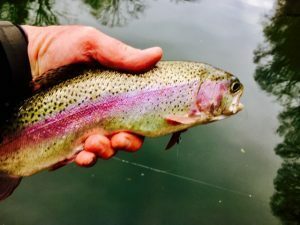 A light rain in the morning proved to make Sunday an epic day of dry fly fishing on The Little Red River. Our clients booked for the day decided that they just did not want to fish in the rain. So what do you do? Go fly fishing of course. We launched the drift boat about 9:00AM, and with the cloudy and rainy conditions Bo pulls out the streamer rod and spent about two hours pounding the banks with a variety of streamer patterns. He managed to bring a few decent fish to the boat but nothing really special. We switched to a nymph rig with a March Brown emerger pattern but it got no interest. 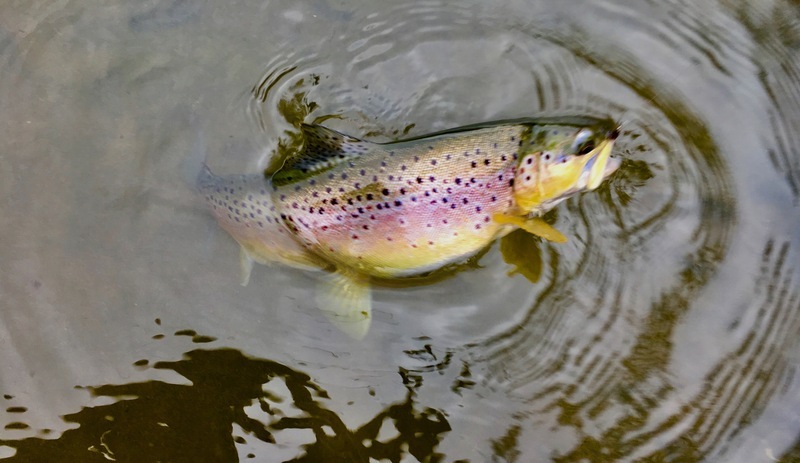 The RG/PT Cruiser however brought several nice fish including a dandy Brown Trout to the net. Just after noon the light drizzle stopped and then everything started. 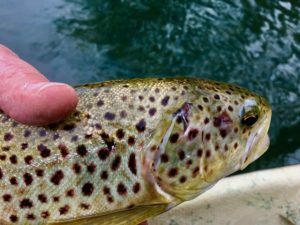 The March Browns started to pop and the fish went on the feed. 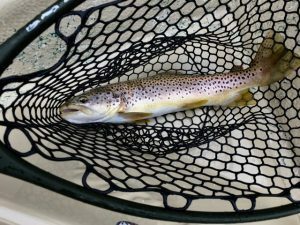 A size #10 March Brown dry fly with a #14 soft hackle emerger pattern as a dropper were a perfect match for the hatch. For about three and half hours we took some really amazing fish. 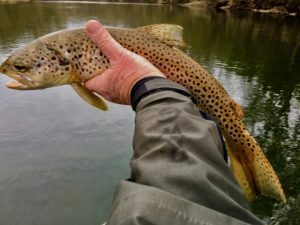 We did not get photos of the two largest Brown Trout that Bo caught as we really needed another angler in the boat to help with photography. On one cast to a rising fish a real March Brown Mayfly landed a foot in front of Bo’s fly and we just knew the big Brown was going to eat the real thing; but just as the fish nosed up the real Mayfly flew off the water we watched the Brown eat our fly! It was really cool to watch. 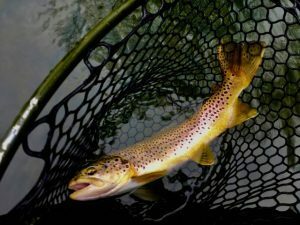 Don’t let a little foul weather deter you; this was the second best dry fly day we have ever had on The Little Red River. Oh yeah, our clients were sick when we sent the photos! !